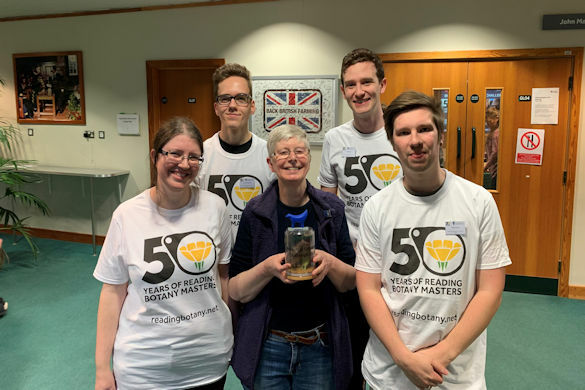 A team of Biological Sciences undergraduate and postgraduate students have been crowned runners-up in the UK inter-university Botanical University Challenge 2019. Undergraduates Tracey Houghton, Jesse McCarthy and Tom Lang along with postgraduate research student Toby Irving – team ‘LiverLambBanana’ – came second in a very close final, being crowned runners-up only after two deciding tie-breaker questions. They beat off tough competition from the University of Southampton and Manchester Metropolitan University in the initial knock-out round and the semi-final before taking on the University of Reading in the final. First held at Kew Gardens in 2016, the event sees University teams compete for the coveted trophy by answering questions on plant-related topics. The Botanical University Challenge next year, in 2020, will be held at University of Liverpool.